Years ago, our innsitter Ginny had a cookie business called “Ginny’s Ginger’s” and she gave me that wonderful family recipe with strict instructions not to share it with anyone else. She’s now a real estate agent with no time to bake, so – here it is!! However, here I have altered it a little by using whole wheat flour, raisins, and cranberries. AND if there are any leftover cookies, or if you just want to be decadent right from the start, dip half of each one in melted chocolate!! You don’t see chocolate and ginger paired very often, and believe me, there is nothing better. Preheat oven to 350. Cream butter & sugar until fluffy. Add molasses and egg, beating thoroughly. Add all dry ingredients in order given, beating just until combined. Add raisins and cranberries. Using a 1-tablespoon scoop, drop balls of dough into a bowl of sugar, rolling to coat. Place each sugared ball on cookie sheet – about 12 per sheet. Bake about 9 minutes. Cool 1 minute on pan and remove to cool completely on wire rack. Optional: Dip half of each cookie into melted chocolate. Ghirardelli Dark Melting Wafers give a glossy finish and is perfect for this purpose. Makes 24 cookies. Notes: You may have to experiment a little to get the desired result in your kitchen. The way you measure flour and the cooking time in this recipe determine whether you get a crunchy or chewy cookie. Slightly more flour and/or a longer cooking time will yield a crunchier cookie. A chewy texture is what I prefer. 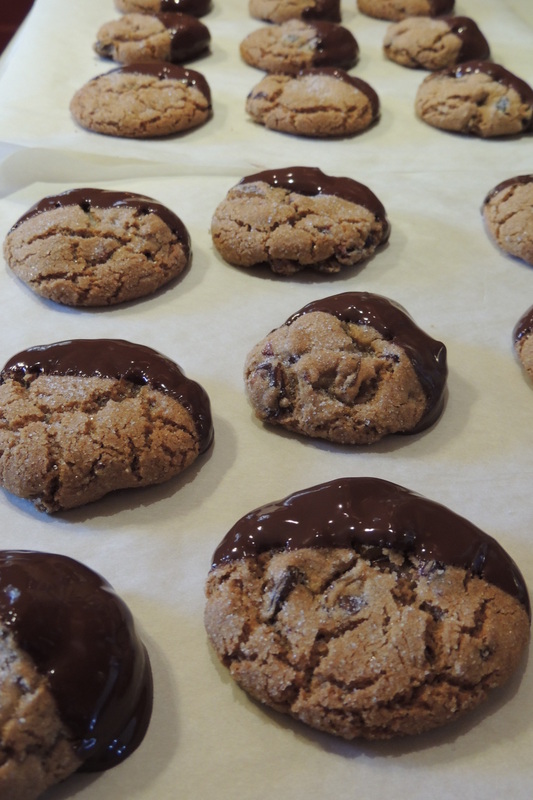 If you get hard cookies, don’t despair – just dip them in chocolate and you will still have a delicious product!